I grew up in the east coast of Canada in a small city called, Halifax. Growing up in Halifax, Nova Scotia didn't really influence me what so ever. I enjoy being in a bigger city and Halifax is so small and closed-minded. I started getting tattooed when I was 17 years old. I would describe my style as being a little metal and edgy. I love leather, spikes and feathers. Whatever I feel like, my style changes like I change my underwear! I think tattoos are definitely a serious art form. A lot of the tattoos I have got, have been based off time periods of my life, style and influences of the time. The tattoo culture right now is expanding and becoming way more acceptable than it has ever been. I'm glad that I am now growing up in a generation where tattoos are less frowned upon. You’re now seeing models on runways with tattoos and pretty much every person you see most likely has a tattoo or two. I knew ever since I was a little girl I wanted to get tattooed and be very heavily tattooed. I don't know where I got a lot of the inspiration for a lot of my tattoos, I just love art and being tattooed. If I want something, I usually don't think twice. My favorite piece right now would probably be my newest, which is the one on my right bicep. 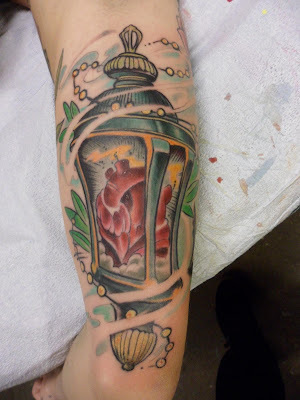 It is a heart inside of a lantern, I got it done at Mata Mata Studios in Hamilton, Ontario by Rob Vino. A lot of my work was done by Scott Forbes at Oceanic Art in Dartmouth, Nova Scotia. I don't think there is a day that goes by where I am not stopped by people asking about my artwork. I don't find my tattoos effect my mood. Honestly, I don't really have any tattoos that have much meaning. I was never one of those people who have to find a meaning in a tattoo to get it. I just love art and I want my body covered in it! I would say to really look into your artists and go to different shops and check out portfolios before settling on one. My mistake for my first tattoos was that I just went to the first guy who I was told. With getting your first tattoo you don't really know any better and he was not a very good artist. So make sure you really look into it so that you’re 100% satisfied and don't have to go and get cover ups! I will probably be completely covered. I love getting tattooed and it’s definitely an addiction. I guess my biggest inspiration is art. I have always been artistic since I was a child. Live everyday like it’s your last.